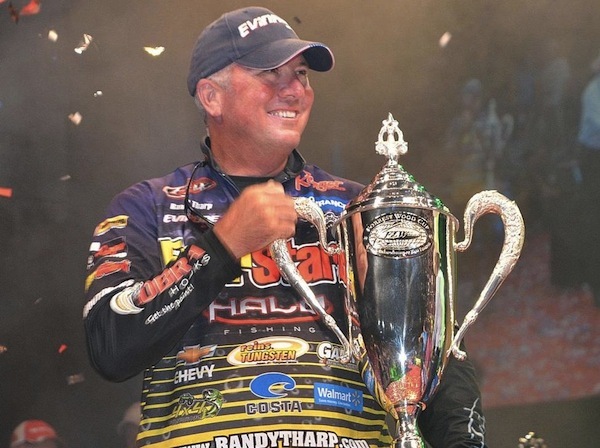 Two years ago, Randall Tharp finished second in the Forrest Wood Cup; his shallow-water pattern outdone by an offshore performance by Scott Martin at Lake Ouachita. There were no offshore patterns at the Red River, and despite a later charge by last years FWC champion Jacob Wheeler, Tharp was able to yank enough bites out of shallow, heavy cover to be crowned FLW’s champion. As for how his championship title affected his Majors Ranking, that is where it gets a little interesting. Obviously, his average improved, but not as much as one might think. Last week, that second at Ouachita dropped off, hurting his average to a 698.786, and this weekend’s victory jumped to 713.847, which was only a little better than it was at the start of last week (there’s not much difference between a first and fifth, average wise). So, with a few other anglers dropping far worse finishes and replacing them with better finishes at this year’s Forrest Wood Cup, Tharp actually fell three spots to 16th this week. Meanwhile, Jacob Wheeler nearly came back to be a back-to-back champion, done in only by a poor first day. Still, his second at the Red River was enough to jump him back into the top 10 in 10th. Mark Rose also joined him in the top 10 (in ninth). Those were just two of a number of moves in the top 10. Bryan Thrift is now third, there was plenty of shuffling about, and Cody Meyer and David Dudley are now both on the outside looking in, in 14th and 15th, respectively. And with as much movement as what happened in the top 10, you can probably guess there were too many moves through the rest of the ranking to capture here in words. So be sure to check out the Majors Ranking.